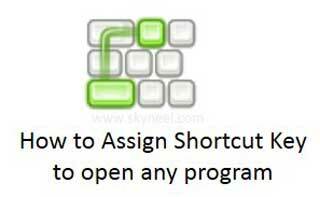 Hi today we know how to Assign Shortcut Key to open any program. We know there are lot of tips and tricks available at this time which reduce your working time. Lot of time we have to take some time to execute any program. There are different ways from which you can open or execute any software or program in your desktop personal computer, laptop, notebook and other. Normally we have to click on the Start button then open required tab and then click on required program, but you can also use different quick methods to open or execute any installed program either from run box or you can also create shortcut key to quickly run the required program. For this first you have to Assign Shortcut Key to open any program then next time when you hit the shortcut key your required program will be immediately open on your desktop screen. Note: Always remember before assign any shortcut key to run any required program you must have to create shortcut of that program on your desktop area. If you don’t have shortcut icon of that program on your desktop area then first you have to create the shortcut key. Step 1: Open the folder in which you have required executable file of the program, which shortcut you want to placed on the desktop area. Step 2: Select the executable file then press right mouse button > Click on the “Send to” option > Click on the “Desktop (create shortcut)” or you can also press “Shift+F10” key after selecting the executable file then select “Send to” option by the arrow keys then > hit enter button when you select “Desktop (create shortcut)” option. Step 3: Now your shortcut will be placed on the desktop area. Step 1: Active the desktop area either by minimize all the running programs or you can also press WIN+D shortcut key to quickly show desktop area or if you are working on the Windows 7, 8 operating system then place the mouse pointer on the extreme right side of taskbar and click on the show desktop area. Step 2: Select the shortcut by click in the mouse then press right mouse button or you can also press “Shift+F10” shortcut key. Step 3: Click on the Properties option which open another dialog box which have normally six tabs like Security, Details, Previous Versions, General, Shortcut and Compatibility. Step 4: Select or click on the Shortcut tab > Take the cursor on shortcut key box then press any required shortcut key > Now, click on the Apply button > Finally click on the OK button. After assigning the shortcut key you have to directly press shortcut key to open that program in quick way. But if you want to remove the shortcut key then open the properties dialog box > Click on the Shortcut key box and then press “Backspace” key to remove the shortcut > Click Apply > OK button. It again show None option in the Shortcut Key text box. Note: Before assign shortcut key for any program always remember that you don’t have to set any Function keys (F1 to F12). You can also not assign these few few keys like Return, Spacebar, Esc (Escape), Print Screen, Scroll Lock, Home, End, Page Up, Page Down, Delete, Insert keys. I hope you like this Assign Shortcut Key to open any program article, use these shortcut keys to quickly run your required programs and share your knowledge with others. Give your important suggestions in the comment box. Thanks to all.